Earlier this year the Japanese Space Agency sent a $273-million satellite into space to study black holes and other celestial objects. Before being lost, the Satellite gathered data and this is these are some of the images it managed to beam back before eventually falling apart. Earlier this year, Japan launched a revolutionary and expensive satellite called Hitomi with the aim of studying black holes and other mysteries of the universe. In strange circumstances, mission specialists soon lost control over the ship. Now, experts have managed to recover some of the data and finally see what Hitomi found out before its destruction. Earlier this year, Japan launched a revolutionary and expensive satellite called Hitomi with the aim of studying black holes and other mysteries of the universe. In strange circumstances, mission specialists soon lost control over the ship. Now, experts have managed to recover some of the data and finally see what Hitomi found out before its destruction. The Japanese satellite Hitomi is an X-ray observatory that was launched by the Japanese space, JAXA, last February. 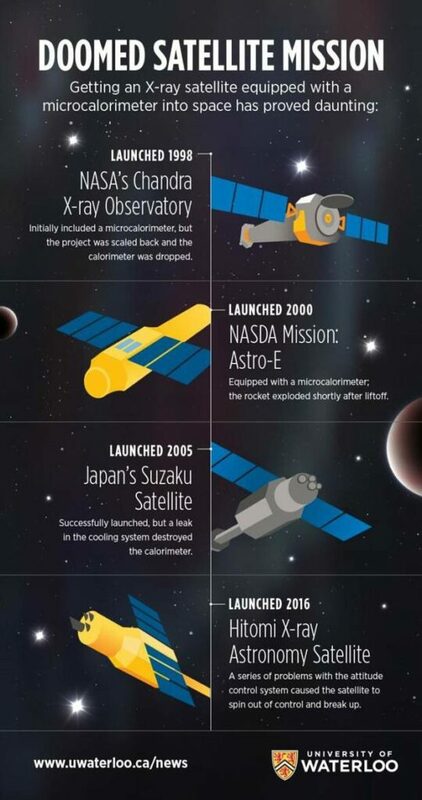 The spacecraft functioned for just over a month before contact was lost. A series of unfortunate events caused both by human error and software malfunction caused the satellite to begin spinning out of control and despite attempts to recover it, Hitomi continued spewing its remains into space and eventually disintegrate. Ultimately JAXA issued a statement saying their $ 273 million mission was lost. When Hitomi was destroyed, researchers announced that they had managed to recover a small fraction of satellite data that they would share with the public eventually. Now, some of these data were published in the Journal Nature. During the satellites short life, Hitomi had enough time to take a look at the Perseus cluster, an enormous group of galaxies gravitationally bound, located about 240 million light-years from Earth, and managed to obtain new data about how giant black holes lurking inside galaxies shape them acting as a kind of “thermostat”. 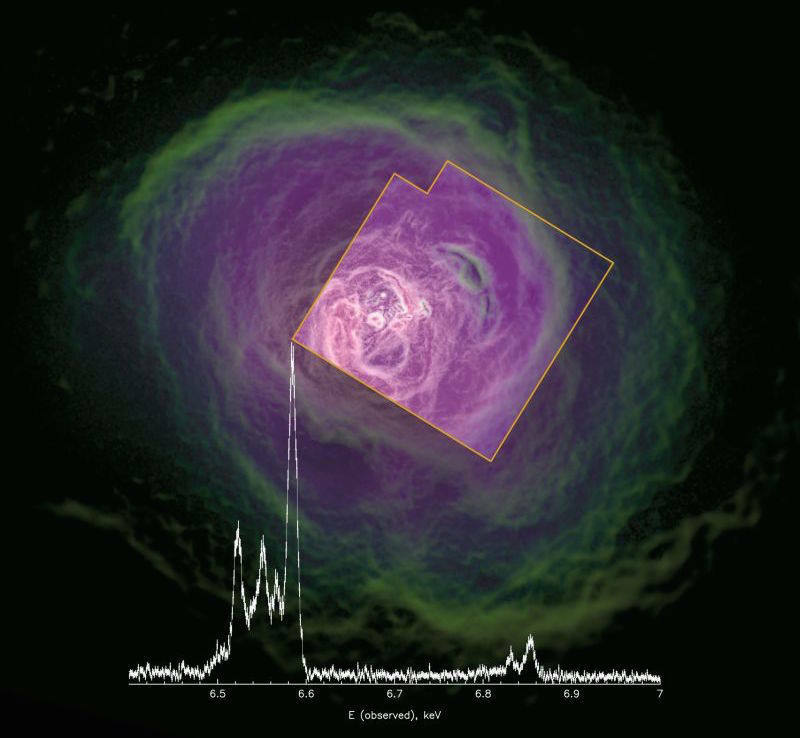 The Japanese satellite found that the Perseus cluster includes not only ordinary matter to form galaxies, but also an “atmosphere” of hot plasma with a temperature of tens of millions of degrees, and a halo of invisible dark matter. Previous studies, some of them dating back to the 60s, have shown that each of the galaxies in the cluster- and indeed most of the galaxies in the universe probably contain supermassive black hole at their center. This heat is eventually released from the event horizon of the black hole, the limit of no return. The matter that remains is absorbed by the black hole, adding to its mass. The energy released heats the surrounding gas, creating bubbles of hot plasma that travel through the group, like air bubbles rising in a glass of champagne. ‘The plasma can be thought of forming an enormous atmosphere that envelopes whole clusters of galaxies,’ he said. ‘These hot atmospheres represent the failure of the past – the failure of the universe to create bigger galaxies. ‘But it’s also the hope for the future. This is the raw material for the future growth of galaxies. The new research sheds light on the crucial role of hot plasma in galaxy evolution. When researchers study the formation of the structure of the universe they wonder: why is most of the gas not cooled as stars and galaxies form? The answer seems is in the bubbles created by the outbursts of energy from black holes which keep temperatures too high for such structures take shape.